This year’s Capstone Urban Sustainability Project (CUSP) is off to a good start with a bright and lively class of students and exciting new features to the course (GG465). For the first class students started getting to know each other, were introduced to research journal writing, and engaged in their first team-building exercise. While the students might not have known exactly what to expect coming into the class, they left with a promise of a kind of learning they have never experienced before. The students will be forming consulting teams and responding to a real Request for Proposals from the City of Cambridge. Because the class will be working in a group for a full year, the course began with time spent getting to know each other through peer interviews and team activities. The consulting groups will be solving real problems for the City of Cambridge and gaining the kind of experiential learning that is exclusive to the C3 Innovation Labs (C3IL), a multidisciplinary partnership within the Laurier Faculty of Arts. 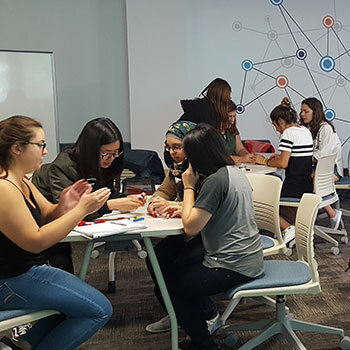 One of the benefits of being a part of the GG465 CUSP course is that the students have access to the new C3IL Open Workspace in the Purpose Lab, which is a bright and inspiring space for those involved in the newly formed C3IL. It is just one of the perks of being a part of this unique partnership. While getting to know the space and each other, the students were split into four teams and completed a Lego building challenge that highlighted the team members’ leadership and communication skills. The groups were quite engaged in replicating the Lego statues that their instructor, Associate Professor Bob Sharpe, had assigned as their first challenge. Students left the class feeling hopeful and excited about forming groups and tackling the Request for Proposals that will be coming in the next few weeks. Keep an eye out here for more updates on the CUSP class as the semester moves along. Exciting things are on the way and we can’t wait to share it with you.